Also known as "Baby Red Hubbard", this high-yielding variety from Japan with wonderfully smooth, dry flesh makes outrageous pies. Fruit grow to 3-4 lbs. Stores for months. 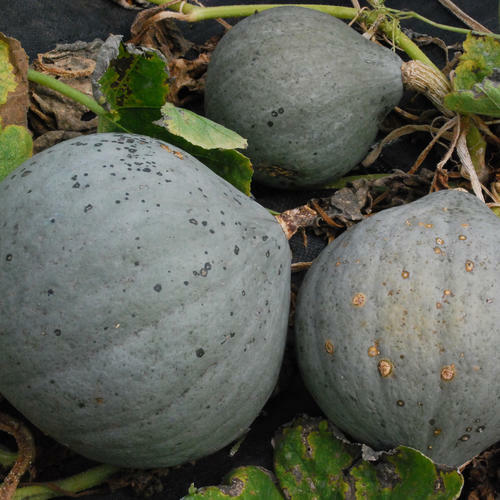 A variety originally from the USA, this smaller version of a Blue Hubbard yields 4 to 6 smooth, blue-grey, teardrop shape fruits with sweet, deep orange flesh, 15-20 cm in diameter. Each fruit weighs 1.5 to 3Kg, one of these makes a meal for a family of four. Keeps well. From direct sowing: 90-100 days. Round courgette which is ready to eat when it’s about the size of a tennis ball, a tasty, unique French heirloom, not available at grocery stores. 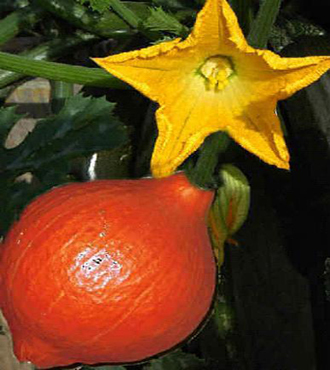 It can be stuffed with delicate delights, steamed and eaten as any summer squash, and has a unique blossom attachment for edible flower use. 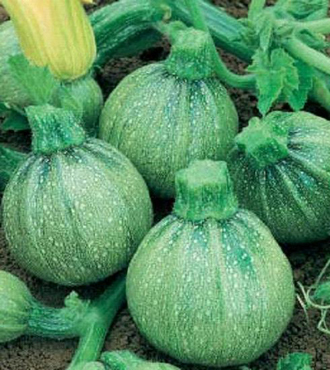 If left to grow will become an autumn pumpkin with a mottled skin. Can be trained on canes etc. 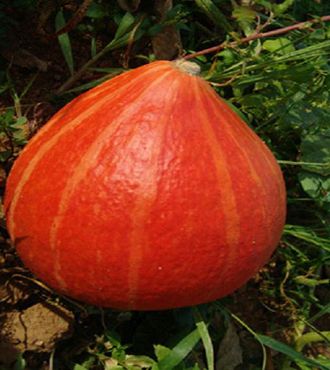 An old variety (1894), prized for its sweet, dry, orange-yellow flesh (the orange flesh indicates it is rich in Vitamin A and is without coarse strings); attractive cream coloured skin with and dark green stripes. Fruit is three inches in diameter and six to eight inches long. 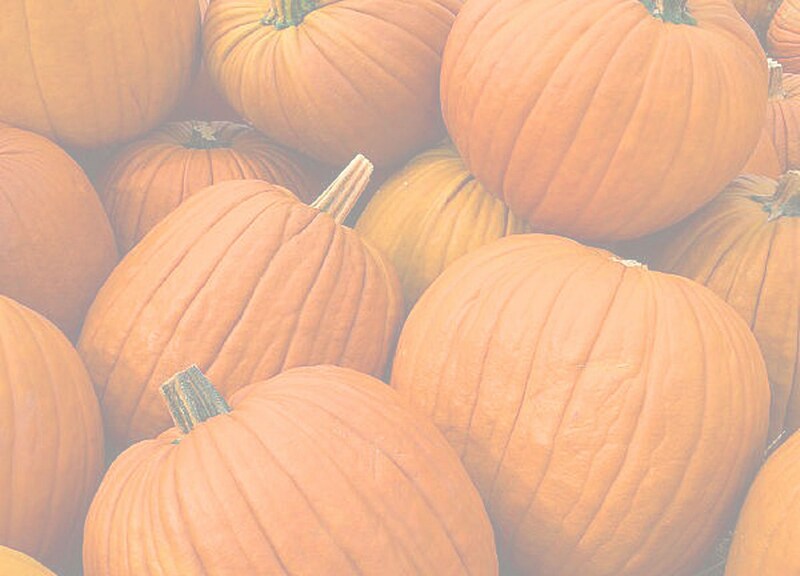 Also known as sweet potato squash because of its flavour or peanut squash because of its shape. 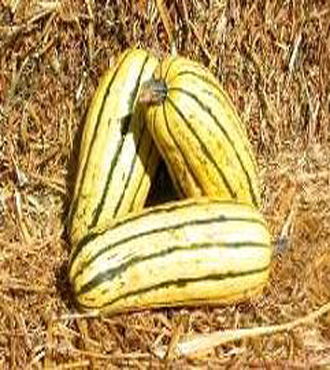 Delicata is very productive and stores well throughout the winter and into spring. Enjoy its fine textured, light orange flesh steamed or baked - Butter and brown sugar are optional when eating Delicata because it is so sweet. Deep round fruits grow 16" across and average 15 to 30 pounds. The exterior is dark orange, hard and ridged. Unlike most pumpkins, Ghost Rider has an excellent black to dark green handle. The interior flesh is orange to yellow orange and is sweet, dry, and stringless making it perfect for baking or pies. The seeds can be roasted. 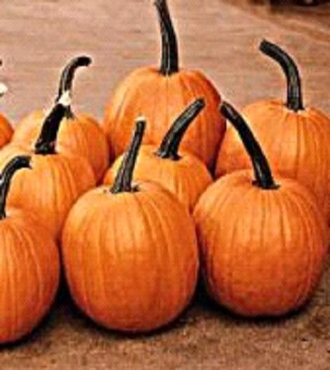 It is ideal for carving and making jack o'lanterns. This variety will store for months. 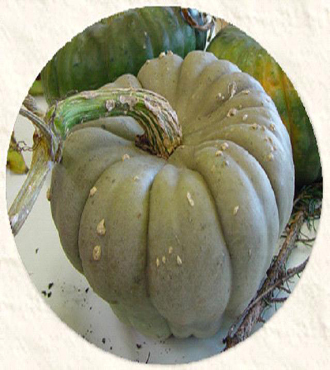 A versatile and tasty Heirloom squash originally from Argentina, Hubbards were introduced to the USA as early as 1798. Golden Delicious is a 1926 cross between Delicious and Boston Marrow originally bred for canning into baby food. Still highly regarded because of its delicious finely grained orange flesh it is excellent for baking, soups and, of course, feeding to the young ones. This high yielding variety produces 8 to 14 lb heart shaped fruits. A great keeper, but also freezes well. Sow or transplant out after last frosts into humus rich soil. Plant 200cm apart. 2-4 fruit per vine. Popular in Australia, this heirloom was introduced to the U.S. in 1932. Beautiful blue turban-shaped 10-20 lb. fruit, deeply ribbed. Very fine, deep golden flesh that is sweet and fine flavoured. The vigorous vines produce two slate-blue coloured fruits which weigh from 3 to 5 kg. It is an excellent variety for winter storage (up to 8 months). Whimsical ornamental gourd. Uniquely attractive, reminiscent of swans with their necks curved down towards their bodies. Fresh skin colour is dark green, with light green speckles changing to a speckled tan when dried.. 10-12" from curve in neck to base of fruit. Fun for children. 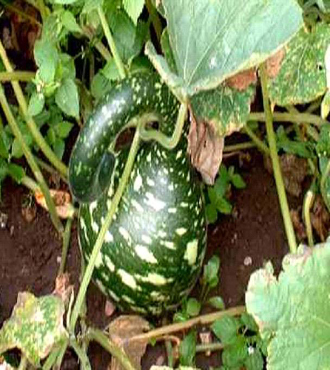 As the gourd grows, the top folds over and usually forms a lump in the neck. A few fruits will have necks that do not bulb.